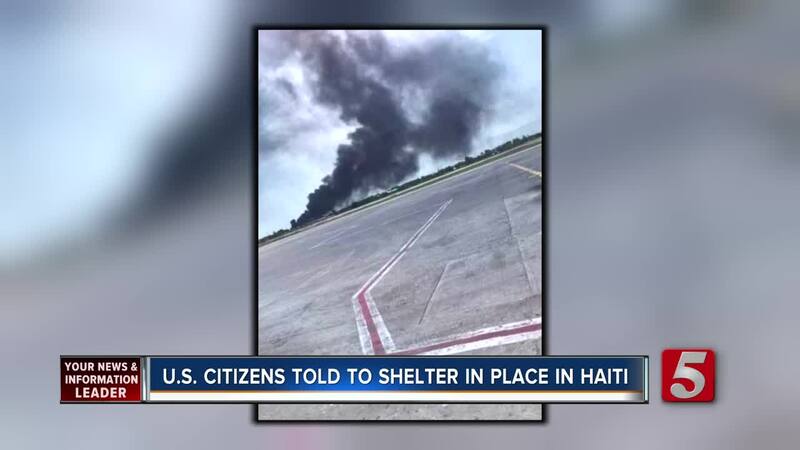 Middle TN Groups Traveling Back To U.S.
Americans in Haiti have been asked to shelter in place as dangerous riots broke out in the country. 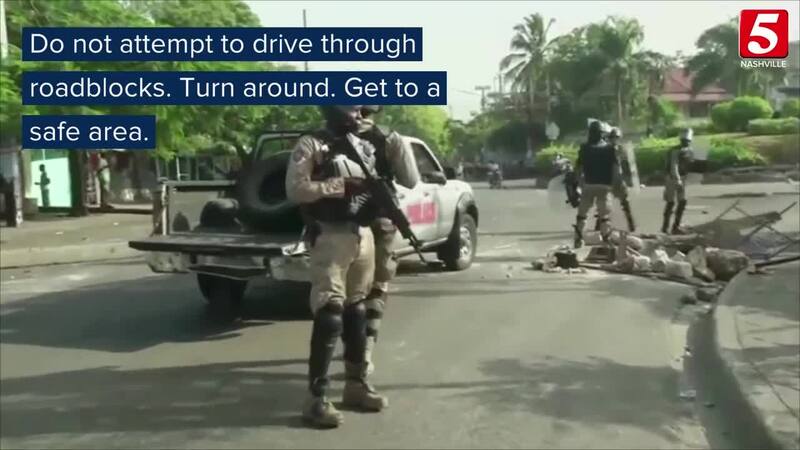 The U.S. Embassy in Port-au-Prince issued the order to shelter in place Saturday as dangerous protests and roadblocks grew in number around that area. They warned Americans to not travel, avoid protests, and to not attempt to drive through roadblocks. According to officials, the roadblocks may be manned by people throwing rocks, but some demonstrators are even armed and will shoot at vehicles trying to pass through. Anyone who encounters a roadblock has been asked to turn around and get to a safe place. Be sure to let family and friends know you are safe. For any Americans in Haiti who need assistance, the U.S. Embassy has asked you to call 202-501-4444. If you are calling from the U.S. about an American in Haiti, call 1-888-407-4747. Savannah Young, from Middle Tennessee, was in Haiti. Her group, called Agape to the Nations that had been on a medical mission trip, had issues getting out of the country on Saturday. "It was a medical trip, so we traveled around pretty much a lot of Haiti, and we did different clinics each day just providing free medical treatment, and also doing like a VBS camp," Young said. While they had been waiting on a flight from Friday night into Saturday, they were not allowed to leave the airport. From the airport, they could see fire and smoke. "So there was no plane there to get us because basically they explained that they didn’t want anyone else coming into the country," Young said. She continued, "We didn’t have a ton of access to water because you just drink bottled water there because Americans can’t really drink their tap." She said they were finally able to get a flight and safely leave for the United States, and as they flew out, they were able to witness the fire and explosions from the air. Jet Blue reportedly sent an empty plane to pick them up. Many others were taken out on charter planes. Young said the views from the flight were bad as they left, and she believed it looked like the rioting became worse after their departure. She confirmed they made it safely back to the U.S. on Saturday, and on Sunday, she said they were safe in Middle Tennessee. They do have friends who are still in Haiti with other mission groups. "They don’t know if it’s safe to stay the week and see how it goes, so it’s pretty scary,” Young said. A team from Riverwood Church of Christ is expected to land Sunday night at Nashville International Airport. As stated, one team with Agape to the Nations is home. A second team with that group is sheltering in place at an orphanage until the unrest goes away. A mission group from Providence Methodist in Mt. Juliet is also sheltering in place. They were supposed to head home Sunday, but they are not getting on the highways or heading to the airport as they have been asked not to do in their area. Thank you for your continued prayers for our mission team in Haiti! The team remains safe in its hotel near the Benevolence School in Lanzac. Unfortunately, the conditions in and around the Port au Prince airport (about 40 miles to the south) have worsened, the airport has closed for the day, and the team was not able to begin its journey home this afternoon as hoped. Tomorrow morning the team is planning to take a helicopter to the Port au Prince airport in order to go through customs and then immediately board a charter plane to Santo Domingo, Dominican Republic. On Wednesday, they are scheduled to take a direct commercial flight from Santo Domingo to Nashville. Please continue to pray for the safety and security of our team as they travel. Pray for favor as they go through the expedited customs process in Port au Prince. Pray for continued strength and peace for our team members, who are anxious to return home. And pray peace for the people of Haiti during this troubled time.